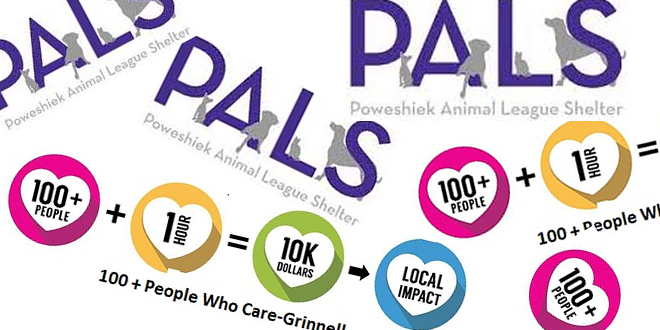 Members of 100 + People Who Care – Grinnell voted at their July 24 meeting to support building renovation projects at the Poweshiek Animal League Shelter (PALS). Specifically, the funds will be used to develop a greeting room for those who are considering new pet adoptions, a feline isolation unit to separate newly acquired cats from the general cat population in the facility, and a new tankless water heater for the PALS building. The new greeting room will permit those who are considering an animal adoption the chance to meet their potential pet in a quiet, private area where they can spend quality time together to better assess the “fit” between adopter and pet. The feline isolation unit will discourage the introduction of disease as new cats are brought to the facility, and the new tankless water heater will replace an old, inefficient system. The application from PALS was one of three considered by the members of 100 + People Who Care – Grinnell. Following nominating presentations for each, members voted, with the PALS projects receiving plurality support. At the conclusion of the quarterly meeting, each member wrote a $ 100 check to PALS. Nine new members joined at Tuesday’s meeting, bringing current total membership to 99. This means that the PALS building renovation projects will receive a total contribution of $ 9,900 through the pooled philanthropy of 100 + People Who Care – Grinnell. The July meeting was the group’s sixth voting meeting, with over $ 46,000 now having been given to help meet community needs. The project stewardship report at the meeting was presented by Melissa Dunham of the Local Foods Connection (LFC). LFC was the recipient of funding at the April meeting of 100 + People Who Care – Grinnell. Melissa described how those donations are being used to expand the scope and capacity of LFC in helping meeting the nutritional needs of children and youth in the area. Grinnell’s chapter of 100 + People Who Care is one of more than 500 such entities across the U.S. and Canada, based on a very simple concept that many people, pooling modest donations four times per year, can significantly benefit their communities. Project funding is determined by the members, with the focus always on local or area needs. Membership remains open to all. The next meeting of 100 + People Who Care – Grinnell will be Tuesday, October 23, 2018. It will be held in the meeting rooms at the Grinnell Mutual Reinsurance building, starting at 5:30 p.m. For further information about 100 + People Who Care – Grinnell, please call any of the founding board members: Christine Day, 641-485-6180; Dennis Day, 641-485-6118; Donna Ricks, 319-269-9626; or Al Ricks, 319-269-3475. Christine is also the point of contact for receiving donations toward this quarter’s project or for making a nomination at the October meeting. Christine’s e-mail address is cday7117@gmail.com. Donna Ricks is the point of contact for membership forms or questions. Donna’s e-mail address is djrteach@msn.com.